Given the proportion of digital start-ups and services that have drawn much of their value from combining data with location (Uber, Tinder, delivery, travel and hotel booking services etc.) — it’s not too hard to argue that there is growth in this space. The company has recently release Elastic Maps, an application for visual exploration and analysis of geospatial data in Kibana — an open source data visualization plugin for Elasticsearch. According to Elastic, location or geotagged data is becoming increasingly prevalent with the rise of sensor and telemetry technology. Almost every instrumented service or connected device is designed to emit some kind of location signal — latitude/longitude coordinates, place identifiers like city, country, and postal codes, or other markers like IP address that can be used to extract a location signal. Elastic Maps gives data analysts a way to visually explore all this location data on a map, alongside other dimensions and variables in their data. 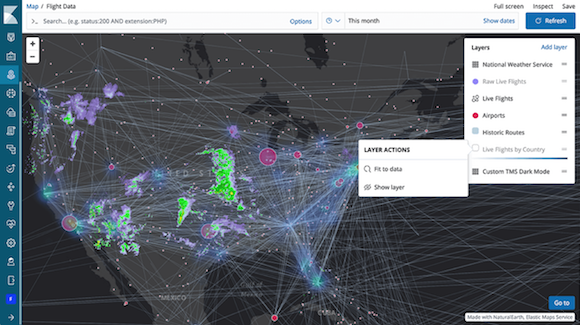 Elastic Maps supports the ability to layer data from different sources in a single map. For example, data developers and data analysts can overlay weather patterns and flight traffic in the same view to see the impact of weather conditions on flight paths in real time. Or, users can embed promotions and sales data in the same map to analyse the impact of a promotion across retail locations. Elastic Maps includes out-of-the-box access to the Elastic Maps Service, providing pre-configured vector layers and base layer maps. More experienced analysts also have the option to add their own custom vector shapes, tile map services, or web map services as layers, allowing them to truly make Maps their own. Elastic Maps is launching as a beta feature in Elastic Stack version 6.7 and ships in the free default distribution. Users can try it by either downloading the Elastic Stack or spinning up a cluster in Elasticsearch Service on Elastic Cloud.